The founders of northeast Indiana’s Advancing Voices of Women (AVOW) will be Indiana Tech’s commencement speakers during the university’s annual commencement celebration on Saturday, May 11, at Allen County War Memorial Coliseum in Fort Wayne. 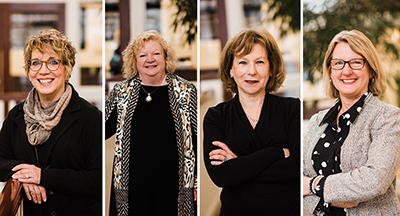 Patti Hays, Marilyn Moran-Townsend, Rachel Tobin-Smith and Faith Van Gilder joined together to establish AVOW in 2017. The mission of the non-partisan group is to advance the voices of women in civic life and community involvement, encourage civil discourse, welcome new voices, and promote honesty and integrity in public service and community conversations. The four leaders were recently recognized by the Fort Wayne Journal Gazette as their 2018 Citizens of the Year. Hays, Moran-Townsend and Tobin-Smith will be honored with the Indiana Tech President’s Medal during the graduate commencement ceremony, and will provide the commencement address during the undergraduate ceremony. Due to a prior commitment, Van Gilder is unable to attend, as she will be honoring her own daughter’s graduation from law school that same day. Indiana Tech’s commencement will take place Saturday, May 11, 2019 at Allen County War Memorial Coliseum. Due to the steady rise in the number of graduates over the years, Indiana Tech’s 2019 commencement ceremony will follow a new format, featuring two ceremonies: one at 9:30 a.m. for graduate students – those earning master’s and doctoral degrees, followed by one at 12:30 p.m. for undergraduate students – those earning associate and bachelor’s degrees. Both ceremonies are free and open to all Indiana Tech students, families, alumni and the public – no tickets are required. A commencement celebration featuring cupcakes and refreshments and there will be food trucks and yard games will be held on Indiana Tech’s main campus immediately following the undergraduate commencement ceremony. Patti Hays is CEO of AWS Foundation. This public foundation was established 2007 with the mission to help individuals with enduring intellectual, developmental and physical disabilities live as independently as possible. She grew up in Pittsburgh and earned her nursing degree at West Virginia Wesleyan College and later her Masters in Nursing from LSU. She has a varied career as a nurse including clinical care, nursing education and hospital administration. She and her husband, cardiologist Peter Hanley, are parents to three successfully grown children. In addition to her work with AVOW, Hays is a member of the Allen County Board of Health, the Allen County/Fort Wayne Disability Advisory Council, Friends of the Rivers and on the board of Visiting Nurse. She has been an active volunteer with other not-for-profits in her 28 years as a resident of Fort Wayne and loves to promote it and its inclusive community to all who will listen. Hays is also a candidate for elected office, currently running for Fort Wayne City Council in District 4. Marilyn Moran-Townsend is chairman and chief executive officer of CVC Communications-Business Storytellers. A native of Seminole, Oklahoma, Moran-Townsend graduated from Purdue University and started her career as a reporter and news anchor in West Lafayette and Fort Myers, Florida, before relocating to Fort Wayne as weekend co-anchor for WKJG-TV. After starting CVC with her husband, Bill Townsend, Marilyn dove into community service at the local and state level, serving two terms on the Indiana Commission for Higher Education as Gov. Mitch Daniels’ appointee. She was chair of the commission, as well as the board of the Indiana Chamber of Commerce. She was a member of the Indiana Education Roundtable and chair of the board of Parkview Hospital. She was co-founder of Elevate Northeast Indiana and a founding chair of Invent Tomorrow. Moran-Townsend is also a recipient of the Sagamore of the Wabash award. She has two grown daughters and five grandchildren. Rachel Tobin-Smith retired as executive director of SCAN at the end of 2016. In her 31 years at the child abuse and neglect prevention agency, she oversaw its growth from two employees and a $28,000 annual budget to 230 employees in a $17 million corporation serving 38 counties in northern Indiana. A licensed clinical therapist, Tobin-Smith is a native of East Liverpool, Ohio, and earned degrees from Ohio State and Virginia Commonwealth universities. She moved to Fort Wayne in 1982 to lead the former Daybreak Children’s Shelter. Since her retirement from SCAN, she has served as consultant to nonprofit organizations and is a member of the Fort Wayne Plan Commission, the Indiana Children’s Trust Fund Board, and the Fort Wayne Board of Zoning Appeals. Tobin-Smith has also been recognized with a Sagamore of the Wabash award for her service to the people of Indiana. She is the mother of two grown daughters. Faith Van Gilder is senior account supervisor at Asher Agency. She moved to Fort Wayne with her husband, David, an attorney, after they served two years as teachers in the Peace Corps in Kanye, Botswana. A native of Defiance, Ohio, she studied journalism and political science at Bowling Green State University and worked at numerous publications, including The Journal Gazette and News-Sentinel, before joining Asher. Van Gilder also serves on the boards of Wellspring Interfaith Social Services, Creative Women of the World, Friends of Cedar Creek and Friends of the Parks of Allen County. She has two grown daughters.